Kyoto, Japan -- Researchers at Kyoto University have announced a breakthrough with broad implications for semiconductor-based devices. The findings, announced in the December 20 issue of the journal Nature Communications, may lead to the development of ultra-high-speed transistors and high-efficiency photovoltaic cells. Working with standard semiconductor material (gallium arsenide, GaAs), the team observed that exposing the sample to a terahertz (1,000 gigahertz) range electric field pulse caused an avalanche of electron-hole pairs (excitons) to burst forth. This single-cycle pulse, lasting merely a picosecond (10^-12 s), resulted in a 1,000-fold increase in exciton density compared with the initial state of the sample. "The terahertz pulse exposes the sample to an intense 1 MV/cm^2 electric field," explains Hideki Hirori, team leader and Assistant Professor at Kyoto University's Institute for Integrated Cell-Material Sciences (iCeMS). 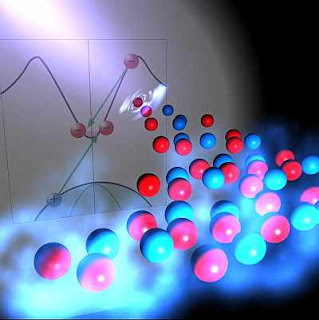 "The resulting exciton avalanche can be confirmed by a bright, near-infrared luminescence, demonstrating a three-order of magnitude increase in the number of carriers." Research in Kyoto using terahertz waves is led by Professor Koichiro Tanaka, whose lab at the iCeMS pursues numerous applications including the development of new biological imaging technologies. The Institute for Integrated Cell-Material Sciences (iCeMS) at Kyoto University in Japan aims to advance the integration of cell and material sciences -- both traditionally strong fields for the university -- in a uniquely innovative global research environment. The iCeMS combines the biosciences, chemistry, materials science, and physics to capture the potential power of stem cells (e.g., ES/iPS cells) and of mesoscopic sciences (e.g., porous coordination polymers). Such developments hold the promise of significant advances in medicine, pharmaceutical studies, the environment, and industry.